An evening I’ll fondly remember when the boys are grown. This little guy will sigh and ask, “How much more does he have to play?” Older brother used to have more time to play, and quite honestly, he still has lots of time to play, but that doesn’t make it any easier for a six-year-old to wait patiently through an hour (sometimes hour+!) of piano playing twice a day. And he needs to remain somewhat quiet. But he’s so good. And really, he is patient. He steals my heart. He used to sit on the floor playing with his dinosaurs, and while a little noise doesn’t hurt, the banging and roaring of dinosaurs was a little too much. So then he began to draw on the art app on our iPad while his brother played piano. After months of that, he grew tired of it, so he moved on to other things. When the weather warmed up, he decided he’d go outside to swing and play with our dog, and he still does that often. Sometimes he sits in the kitchen and looks over our Calvin and Hobbes books. Sometimes he just curls up with me on the sofa and waits. Sigh. “When’s he gonna be done?” (After the first piano practice, the boys get to play games on their digital devices, so it’s especially difficult to wait for that.) But he does. I was kind of sad when he stopped drawing because for the last few years, he loved drawing and coloring, and he often occupied himself doing this. But then he stopped, and I wondered if that interest was fading. 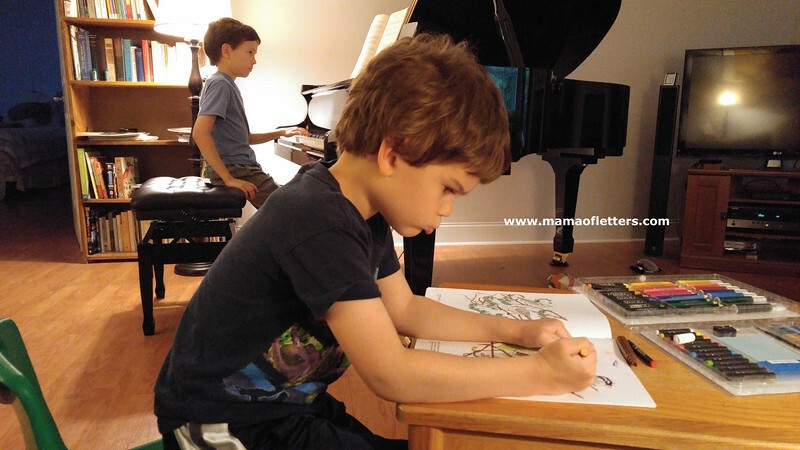 I love this photo also because it nicely wraps up the boys main interests right now: for the nine-year-old, piano, and for the six-year-old, drawing/coloring and birds. I know someday they may move onto other things, but I hope not. I hope whatever they choose to do with their lives, they’ll always love classical music, and they’ll always love birds. And maybe the six-year-old will continue drawing too, even just for fun. Today, the six-year-old brought me his coloring book to show me which birds he had colored, and he told me that for now on, he would color in it while his brother plays piano. Then he hugged the book to his chest and said, “I love this.” He steals my heart.